It's midday in Port-au-Prince and the sun is beating down from a cloudless sky. It's good news, another day without clouds means another day without rain. But it won't last. Everybody knows the rainy season is now only a few weeks away, and a million people have no proper shelter. A park on the edge of Port-au-Prince is sprouting what look like giant white field mushrooms. 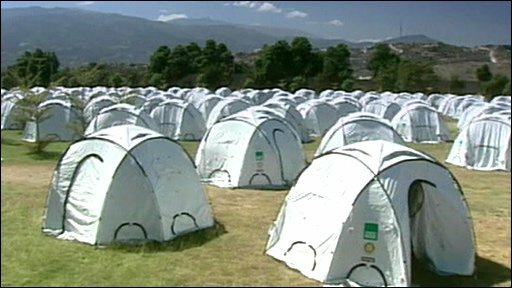 They are actually large white tents, hundreds of them. It's the first proper tent encampment to be built since the earthquake. Along a high concrete wall workers are digging latrines, and building shower blocks. In a few days from now 3,000 refugees from the centre of Port-au-Prince will start moving in here. But they will be the lucky few. Despite repeated calls from everyone - from UN Secretary General Ban Ki-moon to Haitian President Rene Preval - only a few thousand tents have so far arrived in Haiti. "The priority for flights has been given to bringing in food and medical supplies," says Christopher Gascon from the International Organization for Migration (IOM). He is in charge of building the mushroom tent camp. He has 40,000 more tents on their way from Panama, but by ship, not by air. And even when those do arrive, they will not be nearly enough. It seems extraordinary, but so vast are Haiti's needs that there are simply not enough of the right sort of tents in the world right now to house all the refugees. "We are talking about a huge number of tents," says Mr Gascon. "These sort of tents are not widely available. They will have to be made, ordered from China. If you want 200,000 tents now its not going to happen, they are not there." There is also chaos and confusion. The aftermath of every natural disaster is chaotic. But Haiti is especially so. 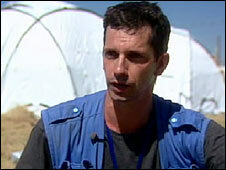 Every aid agency and non-governmental organisation (NGO) in the world seems to have poured in to Port-au-Prince. In the UN compound next to the airport clean-cut young men and women strut around in T-shirts proclaiming "Scientologist Volunteers". In a bar across the street a group of Belgian men are drinking beer. Outside their large white lorry has a banner draped across it with the name of their own tiny environmental NGO. "We want to help, but the World Food Programme says they already have enough water trucks," they tell me. But if the UN base is chaotic, it's nothing to the Haitian government compound. It's housed in an old concrete police station just down the road. The car park is crammed with large four-wheel drives jostling for position and hooting loudly. We manage to track down Charles Clermont, the Haitian official charged with building the mass tent cities that will supposedly house the hundreds of thousands of refugees from Port-au-Prince. "We started work the day after the earthquake," he assures me, "the first camp will be up and running within the next few days." Surprised, I ask him where it is. "It is on the outskirts of the city, there is running water and there will be electricity and spaces, it will be operational within a few days," Mr Clermont says. Intrigued, I take down the details of the location and head out of town. The place is an empty stretch of highway that runs out to the mountains north of Port-au-Prince. One thing is immediately clear, there is no camp. Instead on a stony hillside we come across one of the most extraordinary sites I have ever seen. Hundreds and hundreds of people, camping in the open. As soon as I get out of the car a crowd surrounds me. One young man speaks English. I ask him where he sleeps. 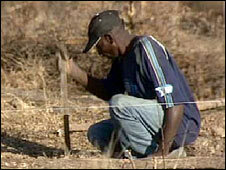 "On the ground," he answers, pointing to a patch of dirt further up the hill. I ask him if he has had any help, any food or water. "No," he says, "we have nothing." Further on I find a young mother and her seven children squatting in a tiny shack they have fashioned out of sticks and old blankets. One of her children has a huge bandage around his hand. "He had two fingers amputated after the quake," the mother says. Nearby Salnar Devoisie is lying on a makeshift bed. Her daughter is platting her mass of grey hair. There is a white bandage around the stump of her left leg. "I was trapped in the rubble of my home for three days. When the Israeli doctors got me out they said we will have to chop it off or you will die," she says. As we talk she rubs her hand against her chest as if in pain. "It is gas. I haven't eaten for four days." Despite the massive response from the outside world these people are still waiting for help to arrive. And for nearly a million Haitians the coming night will be another night spent in the open.